Ah, the power of recommendation! I picked Neil Gaiman's book only because I knew he used to work with Terry Pratchett - and if you do anything with Terry Pratchett, I will... Ok, perhaps not actually worship you, but you'll have my attention even before you start talking. American Gods was a good choice. 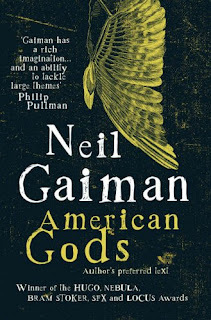 Gaiman himself describes the book as 'odd' and I can't help agreeing. It's a strange mixture of fantasy, thriller, crime and comedy, weird but pleasant. The plot does not exactly overwhelms with surprises (or perhaps I am really difficult to surprise), but the story is dynamic and written so well, that putting the book down is hardly possible. A word 'page-turner' springs to mind, perfect for long queues in nasty places or boring journeys. The idea is simple - all the immigrants flocking to America in their millions over the centuries must have dragged their gods along. It appears that being a god in the modern era is not so easy. No blood sacrifices. No worshippers. In some cases, not enough belief to survive... New deities spring up with the ascent of new technologies and conflict between them and the old-timers seems imminent. Puny mortals get caught in this mess and survive... or not. Overall, American Gods is a highly enjoyable piece of adult fiction.